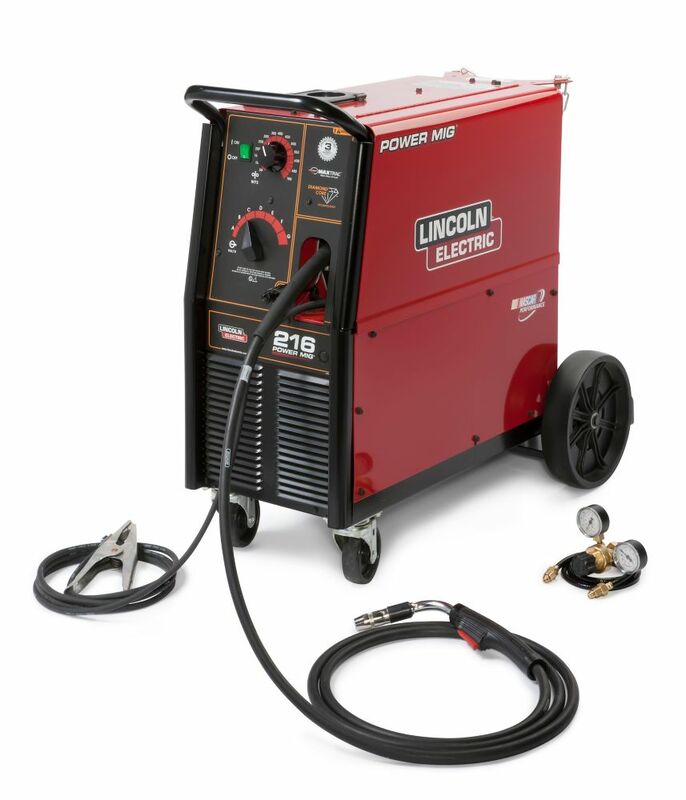 The Lincoln Electric Power MIG 216 offers the autobody and sheet metal fabrication industries top welding performance with a host of professional features. Some of these include : Diamond Core Technology, which delivers a forgiving arc, excellent out-of-position arc action, low spatter and a wide voltage sweet spot for steel, stainless steel or aluminum. A MAXTRAC Cast Aluminum Industrial Wire Drive, which features dual driven rolls, regulated wire feed speed control, brass-to brass connections and Lincolns 100% wire supporting split wire guide system all assist to deliver an easier welding experience. Now with more output and better efficiency. This machine features the best in class rated output, wide amperage range and efficiency. Easily upgradable spool gun ready; Just remove the standard MIG gun and plug in the economical Magnum<sup></sup> PRO 100SG spool gun for enhanced aluminum wire feeding performance. 230V input. 216 amps output / 22VDC / 30% duty cycle. The Lincoln Electric Tomahawk plasma cutting systems are portable enough to carry to any jobsite. Hook up the compressed air, grab the torch and start cutting right away. The Tomahawk 625 is rated for up to 5/8" max cuts. Other key features include : Continuous output control, which focuses the arc for different material thickness. A touch-start system, for a reliable plasma arc initiation without high frequency. Rapid Arc Restrike, for fast cutting through gaps, even expanded metal. Front Panel Purge Control, which makes it easy to set the air flow rate without initiating the plasma arc. A new electrode and nozzle design saves you money in the long run. Our parts-in-place system detects correct installation of consumables and torch. Lightweight and portable, the unit is easily carried by one person. Engine drive compatible. 230V input. PowerMig 216 The Lincoln Electric Power MIG 216 offers the autobody and sheet metal fabrication industries top welding performance with a host of professional features. Some of these include : Diamond Core Technology, which delivers a forgiving arc, excellent out-of-position arc action, low spatter and a wide voltage sweet spot for steel, stainless steel or aluminum. A MAXTRAC Cast Aluminum Industrial Wire Drive, which features dual driven rolls, regulated wire feed speed control, brass-to brass connections and Lincolns 100% wire supporting split wire guide system all assist to deliver an easier welding experience. Now with more output and better efficiency. This machine features the best in class rated output, wide amperage range and efficiency. Easily upgradable spool gun ready; Just remove the standard MIG gun and plug in the economical Magnum<sup></sup> PRO 100SG spool gun for enhanced aluminum wire feeding performance. 230V input. 216 amps output / 22VDC / 30% duty cycle. PowerMig 216 is rated 4.5 out of 5 by 4.